Climate change alarmists portray a catastrophic rise in sea level as one of the chief dangers of global warming. They draw pictures of the Statue of Liberty up to her chest in water, and so on. I doubt whether many people actually believe these dire predictions, however. If they did, prices for oceanfront property would be collapsing. That isn’t happening, which suggests that a lot of people pay lip service to global warming hysteria who don’t actually think it has any scientific basis. There has been no dramatic and consistent sea-level rise in the past century, and projections show no dramatic rise is likely to occur in the coming century. There is no correlation between CO2 concentrations in the atmosphere and sea-level rise. 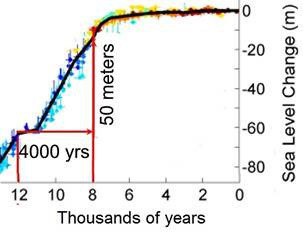 For the past 2,000 years, Sea Level rise was unchangingly linear, increasing between 1 & 1.5 mm/yr. The maximum rise is about 6 inches per century. This has continued for the past 135 years, even though CO2 concentrations have increased by 38%. It must be remembered that in addition to the ocean rising gradually–very gradually–as ice continues to melt, slowly, the Earth also subsides. But subsidence is local, depending on soil conditions in a particular place. Cities that are built partly on landfills, like Miami, are especially likely to sink. When you read in the newspapers about alarming conditions caused by rapidly rising sea levels, it is almost certain that what is mostly happening is that the land is subsiding. So, unless the prices paid for beach properties suddenly plummet, you can be confident that hysteria over rising sea levels is just one aspect of financially-motivated global warming hysteria. This meme is a collector’s item because it is dumb on multiple levels. First, there is no prospect of the sea overtaking the Statue of Liberty; not in the next few millennia, anyway, and by then we may be well into the next Ice Age, with sea level falling once again. Second, the claim that there “[aren’t] any gun background checks” is idiotic. 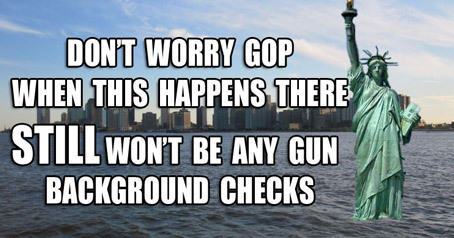 Millions of such background checks are done every year. I myself have gone through five of them. Whoever wrote this has no idea what he is talking about. And finally, the meme is a non sequitur. There is zero relationship between rising sea levels and gun laws. There is, in other words, no point to the point. It is typical of global warming hysteria that it causes liberals to argue really, really badly.